Ever wonder why your gums bleed? Well, there are many reasons why this could be happening. Bleeding gingiva or gums, is a symptom of inflammation of the gums, or what we call gingivitis. Gingivitis is most often caused by poor oral health: lack of brushing and especially flossing. Often, pregnant women get what is commonly referred to as “pregnancy gingivitis.” This is caused not by poor oral hygiene but by upregulation of hormones during pregnancy. Patients on blood thinner medications such as Coumadin may also experience bleeding gums. If you are brushing too hard or using a hard bristled toothbrush this can also cause your gums to bleed. If this is the case switch to a soft bristled toothbrush and brush more gently. 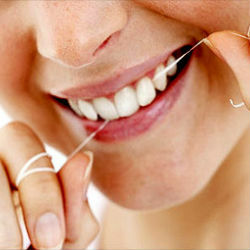 Starting a new flossing routine will definitely cause your gums to bleed. This bleeding will cease within a week of beginning your new flossing regimen. If you are concerned about bleeding gums contact your local Bloomington, Indiana general dentist today here at Create-a-Smile to schedule an appointment for a consult.